Develop office productivity and positivity with the right space planning and office interior design. With 20 years worth of experience and knowledge within their team Vision Projects understands the needs for the right commercial office design to keep your workspace running smoothly and efficiently. 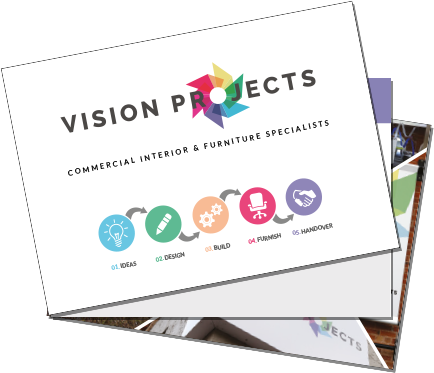 Businesses need to be designed and refurbished in a way that suits each workplace specifically and individually, Vision Projects can produce high quality office designs that are perfectly suited to you. The first and one of the most important stages of the design process is for Vision Projects to meet with the client and establish their goals and requirements for the fit out project. This is paired with a survey of the current space and creating an ideal proposal and brief with the client. Vision Projects not only analysis the key space but also talks to key staff members to gain and understanding of the departmental relationships and cultures, allowing them to produce the best and most suitable designs. Stage two delves more into defining the space and what it needs to be used for. This not only looks at staffing uses but building constraints and areas that might be specific requirements and attention. All this is then presented to the client for Vision Projects to gain approval and move onto the next stages. During stage 3 and 4 Vision Projects can make some very visual and very appealing space plans allowing the client to see their business office designs come together. Within these designs a full scheme of information will be included, showing the client the finishes/sample board, details elevations of key spaces and beautiful 3D visuals. Vision Projects will also gain full compliance with building regulations during this stage to get a final, full scheme sign-off by the client. Within the final stage of the process Vision Projects prepare all working drawings of the projects to show the spacing arrangements, lighting, ceiling plans flooring and decoration as well as building elements such as a fire strategy and small power decisions. This all comes with a detailed schedule and specification for the client, including the furniture, flooring and fitting plans. To request more information on our services or to discuss your project with the team, simply tell us your details and our team will call you back!